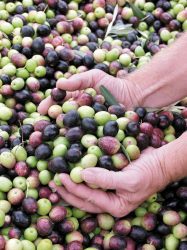 On November 7th and 8th Umbria will once more become Italy’s olive oil hub with an entire weekend devoted to the region’s DOP quality provenance denomination extra virgin olive oil. The 12th edition of Frantoi Aperti, organised by the DOP "Umbria" Olive Oil Trail, the DOP Umbria protection consortium and the Città dell'Olio league of Umbrian oil-producing cities, will in fact lay on a broad programme of events and activities, offering visitors a chance to learn more about olives through a variety of activities ranging from olive picking to visits to olive mills, theatre performances, cultural attractions, trekking through olive groves, guided museum tours (including Trevi’s Museo dell’Olio) plus a whole range of culinary tips to learn how to best employ olive oil in the kitchen. Although most of the events will culminate over the November 7th and 8th weekend, this year’s edition of Frantoi Aperti will continue through to December 8th, with olive mills throughout the region more than happy to welcome visitors to come and see how oil is extracted from the fruit. • The Nahar adventure park, enclosed within one of Italy 's largest alpaca farming areas, offers tourists the chance to spend a day experimenting new sports and generally having a good deal of fun in an unparalleled natural setting!